It’s funny how when the universe asks you to be one way, you yearn, or yen for the other way. Do we automatically crave what we can’t have? (mmm, note photo above). I mean just when I need yang energy to be confident, active, out-there, socialising, I feel like I have a yen for yin. Problogger Conference is on this week, and you have to put yourself out there, fired up with yang bravado. Plus I’m contemplating whether to apply for a role at work that is right for me (I’ve been doing much of the work in de-facto mode for a while), yet it will be challenging and I’ll have trouble negotiating it down from full time (I’m part-time, four days a week now and would love to stay that way, BUT). So what to do – crawl back into a yin hole, passive, waiting to see what happens with an ‘if it’s meant to be’ attitude? Or actively give myself the best chance of making successful connections at Pro-blogger and being successful in securing the new job (presuming I decide it’s what I really want)? Balance is not always equal – at any given time we don’t need to balance out yin and yang equally, just as any conversation doesn’t need to be an exact balance of speaking and listening. One-sided conversations are never very comfortable (especially for the person whose ear is being chewed off by the chatterbox). Being excessively yang is not the best way to make friends and influence people, especially at a conference when everyone is trying to connect and make their mark. Over-confidence doesn’t go down too well in job interviews either. So, there’s room for yin in what is shaping as a yang couple of weeks. 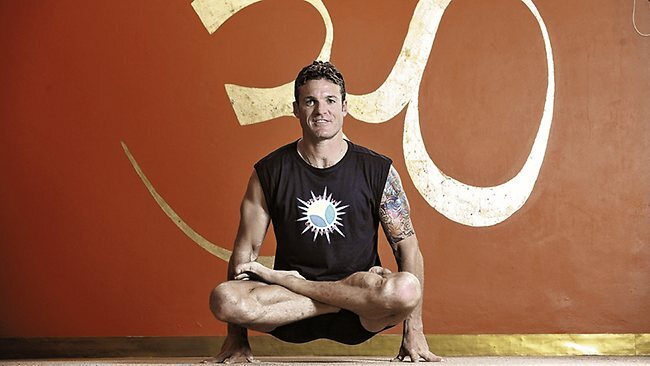 I did a yoga workshop on Sunday – Hips, hearts and healing, with renowned yoga expert (not sure if her refers to himself as a yogi or a guru) Duncan Peak of Power Living at the studio I go to on the Gold Coast, Fireshaper. I’m loving hot yoga at the moment, and feeling more flexible and strong than I have for some years. The practice, being hot, is quite yang, although there are floor sequences (or asanas) that are more yin, slowing the heart rate, holding stretches for longer. Duncan Peak focused on yin yoga (with a few faster flow sequences thrown in for good measure). And it was hard – holding challenging poses, letting go, really releasing. He’s supremely flexible, and then he introduced his senior instructor and program manager, Kristi Abraham, who used to be an Olympic Rhythmic Gymnast. Needless to say, this woman is the most flexible person I’ve ever seen. Duncan reminded us that yoga (and he and I would say life) is never about ‘pushing ourselves to our limits’ but allowing ourselves to stretch as far as we can. There are anatomical limits (bones that get in the way) and we shouldn’t be pushing into pain, but surrendering into it. He also spoke of how none of us is symmetrical (the whole balance isn’t equal idea). I’ve long had a hip ‘injury’ – pain focused around my right hip that radiates around from my tailbone. This restriction has affected my ability to do some balance poses on my right side, changed my running gait so that I can’t seem to run comfortably and sometimes caused chronic pain. I’ve tried different treatments over the years, and have my theories about the root cause of the pain at an emotional level (the hips ‘hold tight’ on the body’s emotions). But maybe I just need to accept that I am assymetrical, that I will never get the same range of movement, and that’s OK. Perhaps the healing comes simply in the surrender. So back to Problogger and I’m going to take the approach of stretching without pushing, yang with yin. There is a definite difference between pushing and stretching, and I reckon that stretching takes us further than we realise we can go, far further than pushing. And if you are going to Problogger, or visiting the Gold Coast sometime soon, be sure to check out my Welcome to My Gold Coast post – jam full of a balanced guide to the place I call home – secrets local love but you might not know about . Hope to see many of you here in the sunshine. A really thought provoking post Kathy ! I like the statement that ‘Balance is not always equal’ – it reminds me of A and myself – sometimes I give more and sometimes he does – it’s not about each giving the same all the time. I have difficulty balancing the yin and yang a lot of the time in my life. I am really shy and quiet but then when I get to know you, I’ll talk the hind leg off a donkey. I am mindful of how much I talk and am trying to stop but it is so hard when I have done it for so long !!! Lovely post, balance is so important. I always feel it when I am out of balance. Much to contemplate there Kathy. My former yoga teacher used to say something similar about stretching ourselves. I’ve been away too long but reading your posts on balance are encouraging me to find a way back, slowly and without judgement. I wish I could be there on the weekend and meet so many of you fabulous women!